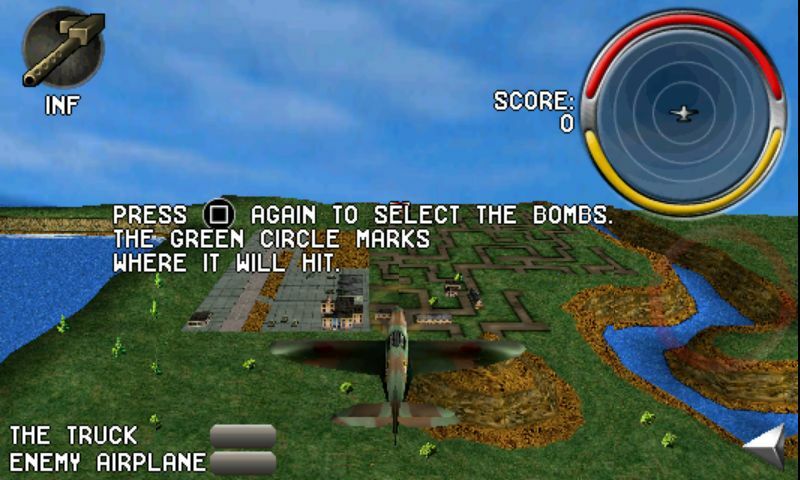 Are you in the mood for an arcade style flight simulator with bombs, machine guns, WWII planes, the whole shebang? Armageddon Squadron might just be the answer to your blood-thirsty prayers. Flying, fighting, shooting, destroying buildings, crushing opponents, protecting one’s own troops – oh yes, this is the real deal. Find out more in today’s review. First things first: there are 10,12 MB to download. Once this is done I check to see what the app’s required permissions are. Some of them strike me as somewhat odd (why would a game need to access my phone’s status? ), but whatevs, I go for it anyway. Hit ‘Options” in order to regulate the volume of the music, change the sound effects, invert the Y axis and make changes to the controls sensitivity. ‘Help’ provides users with useful information regarding the controls. 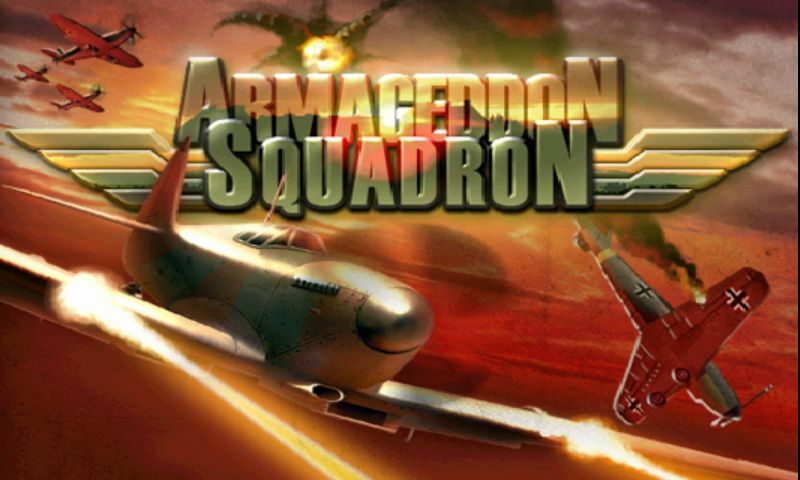 I hit ‘New Game’ because I’m eager to give Armageddon Squadron. The bomb drops and explodes in my face revealing four game modes for me to choose from: Tutorial, Campaign, Time Attack and Arcade. I’m a Armageddon Squadron newbie so I decide to go for Tutorial. I’m told how the controls work (a cinch for anyone who has some plane games experience). Basically, all you have to do is tilt your smartphone in order to move the plane and tap a button on the bottom right to shoot. There’s a button on the top left that lets you check out the weapons menu. One thing that confused and irritated me in the tutorial mode: a certain functions calls for pushing the rectangle, or R or B – but my phone doesn’t have any of these things. The game was optimised for Sony Ericcson Xperia Play, so unless you’re running it on that you may experience the same thing. The arsenal at my disposal: machine gun bombs (to the front and back). Whenever an enemy is near a warning (in the form of a red ring) flashes up, inciting me to attack. The cross hairs automaticaly fix the enemy as soon as he is close enough. The menu button is positioned suboptimally in the sense that it’s located right beneath the shooting ring. I accidently hit it a few times when I was really caught up in the heat of the moment. That said, I got used to it after playing a few times and the problem no longer arises now that I’m an old hand at the game. I raze a tank, a plane and an entire building to the ground and am summoned to present myself to my campaign. 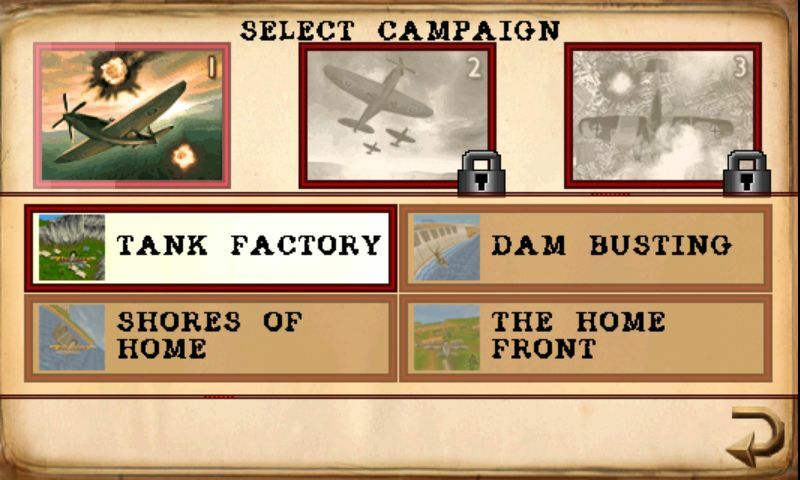 There are three campaigns to choose from, each consisting of four missions, making a total of 12 missions. New campaigns (and hence missions) are activated as you play. The circle located at the top of the display serves both as a radar as well as a life and speed indicator. The airplane’s speed can be altered using the yellow bar. The icons symbolise your enemies – looking at them you can tell in what shape your opponents are in, and hence what your mission’s targets are. The amount of weapons indicate how much ammunition per weapon there is. The transparent arrow shows me from which direction my enemies are coming from. Some levels have to be completed within a time frame; this is indicated within the weapons menu. Now, if that sounds like a cluttered UI you can breathe a sigh of relief because it’s actually a lot easier and intuitive than it might sound. The game is very animated and there’s always something going on, which makes for a fun and optically stimulating gaming experience. When I first started playing I was taken aback by a sound that I can only describe as mechanical flatulence. I soon found out that this sound is there to let me know that my machine is pretty damaged and thus calls for caution on my part. Armageddon Squadron just keeps getting better and better. It is amazing how sophisticated smartphone/tablet games can be. The details in the graphic design are beautiful and the controls are smart. The game is really action-packed and there are quite a few planes, levels and missions, so get ready for a long flight. I must say that the sound effects made me smile (plane wind, how rude! ), but they don’t lessen the enjoyment to be had. If that isn’t enough, there’s a multiplayer mode. There’s a whole lot going on on the Armageddon Squadron display, but somehow things manage to stay organised enough so as not to become confusing. My only meager bone of contention would be the somewhat unfortunate placement of the menu button. Aside from this controls are very smooth and my overall impression is very good. I am beyond impressed with the graphics and controls. 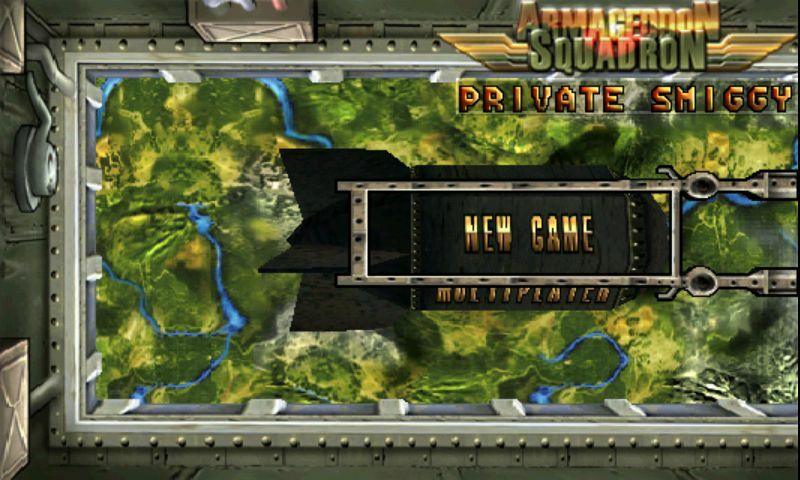 Armageddon Squadron is visually very detailed, which means that it can take a brief while for stuff to load, but not to a point that it could be considered a nuisance. It hasn’t crashed on me once so far. Armageddon Squadron usually costs US$3,56 // EUR2,66, which is a hefty sum IMO. Seeing as it is our App of the Week you can pick it up for only US$1,74 EUR1,30. Not bad!